I have a confession to make: I am a terrible saver. I can plan ahead financially, make budgets, think twice about expenses, and try to exercise some self-discipline, but I am bad at saving. I can cut expenses, lower my bills, and coupon with the best of them, but if I have the money sitting in a line item of my budget, chances are it will be spent before the month is up. Saving for a rainy day is critical. If the car suddenly needs a new tire, or the dog needs an emergency trip to the vet, I really want to be able to have an extra $100 dollars available. Especially if a major problem arises such as a job loss or emergency medical expenses, I would like to have money set aside for that as well (and these things require far more than $100). But how do you save when you are living on a tight budget and are just making enough to get by? You make saving a line item in your budget. It’s the only way that I can squirrel away any money. If I see the money, I will spend it. So I take it out of my account automatically with monthly automatic deposits into my savings account. Many banks have automatic savings programs which can work to your advantage. Bank of America has the Add It Up program which rounds debit card transactions to the nearest dollar and deposits that change into your savings account. I believe Wachovia has a smiliar program. These programs are an easy way to accrue a bit into your savings account every month without having to think about it. Since I use my debit card a lot I often end up with over $30 a month transferred into my savings account without even thinking about it. To budget for saving using the Add It Up program, I start with a total amount which I want to save each month as my line item, then I enter the debits from my checking account into my savings account which draws down the balance. I also set up automatic debits from my checking account into my savings account each month and enter those as further debits from the savings line item. At the end of the month when there is any money left in any of the line items (or envelopes), then I transfer that money into savings. This sounds simple but it is not easy. Saving is the epitome of delayed gratification. Sometimes, it doesn’t even seem gratifying. It is much easier to buy something I want now than to hide that money from myself for when I will actually need it. But I’ll tell you what, when an emergency comes boy am I glad that I have something squirreled away. The alternative to saving is debt. If I do not have money saved and an emergency expense comes up, then out comes the trusty credit card. Honestly, the whole reason for having a credit card is to make a loan to yourself (with interest unless you pay it back within the month) for an expense you want or need. Now, I could forego that vacation that I could put on my credit card. Or that dinner out at our favorite Italian restaurant. But can I in all honesty say that I will forego paying for an necessary medical expense or car repair? Sure, I can get by without a car (begrudgingly), but not paying your medical bills only leads to debt. As for those non-emergency payments that are still super important, like traveling to California next year for my sister’s wedding, saving up for them is also really important. I have gotten into the bad habit of robbing my emergency saving money to pay for special events rather than saving separately. 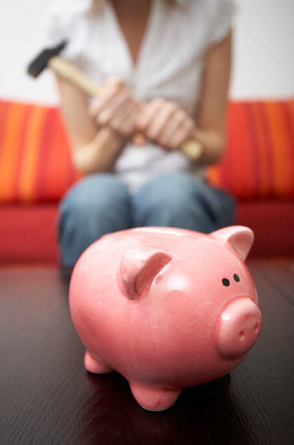 This often can backfire because then you return home with your savings totally wiped out. And life has a tendency of continuing on regardless of if you just went on vacation, so the car may still break down later that week. So add saving into your budget. Even if it is only a little, it will let you breathe easier later. Making Do With What You’ve Got: Part II: Balance Your Checkbook!